The twelve animals of Tibetan astrology according to the Yungdrung Bön texts are the Rat, Elephant, Tiger, Rabbit, Dragon, Horse, Snake, Sheep, Garuda, Monkey, Dog and Pig. Each animal has an associated element for its life-force and a direction which is determined by the life-force element. Not only are these twelve animals associated with a particular year, they are also associated with particular months, days and hours. The year 2014 is the year of the Wood Horse. 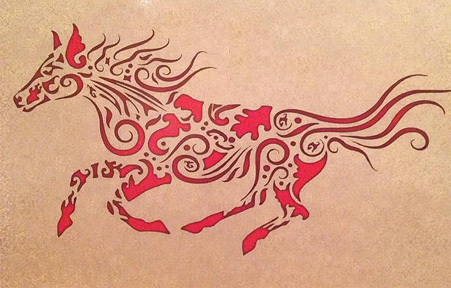 Therefore, all people born on or after March 2, 2014 until the next lunar Tibetan New Year are Wood Horse people. These individuals will have a vitality that is governed by the element Fire, a physical body that is governed by the element Metal (which corresponds with the element of Space), personal power that is governed by the element of Wood (which corresponds to the element of Air), Lungta or luck that is governed by the element of Metal and soul energy that is governed by the element of Wood. In general, the Horse is very energetic with an active mind. It is inspired, motivated and charming. It wants adventure and exploration rather than to stay at home. It is always on the move and in excess this can become a kind of instability or an inability to stick with things long enough to complete them. This life of excitement can sometimes give way to impatience. The Horse can be quite charming, likes to talk, and therefore finds it difficult to keep secrets. Although it appears independent, because of the fear of failure the Horse relies upon the validation and support of friends and family. The Horse’s direction is South. The Horse’s soul day is Tuesday and the life-force day is Friday. These are the best days for beginning new projects and activities that are meant to grow and increase. The obstacle day is Wednesday. This day is best for cleansing and letting things go. It is not a favorable day for beginning new things. Posted on March 3, 2014, in Five Elements, Tibetan Astrology, Uncategorized and tagged astrology, five elements, new year, Tibetan calendar, Tibetan culture. Bookmark the permalink. Leave a comment.